Interview with Artist Dread Scott about His Upcoming "Slave Rebellion Reenactment"
Over two hundred years ago, the largest rebellion of enslaved people in American history marched across the Louisiana landscape on their way to New Orleans. The amassed 500 enslaved African Americans carried with them a radical idea of taking back their freedom and ending slavery. While this history has been left out of major historical texts about the American culture of revolutions and rebellions, American artist Dread Scott aims to resurrect the movement through his upcoming work entitled “Slave Rebellion Reenactment”. I chatted with Scott in early December of 2018 about his upcoming piece “Slave Rebellion Reenactment”, the political and social unrest of the United States, and how art fits in with our current social discourse. Dread Scott is well known for his political and protest artworks such as “What is the Proper Way to Display a US Flag?”, which garnered the attention of not only the art world, but also President George H. W. Bush and the US Senate in 1989 who voted to outlaw the piece from being displayed. Scott says his work “focuses on key concentrations of social contradiction that is really looking at big questions in front of humanity”. Scott explains that when doing work that is for public display, as opposed to in a museum or gallery, it provides him with the opportunity to interact with an audience that may not typically enter traditional spaces where art is exhibited. “Slave Rebellion Reenactment” is a project that both works within the artistic interests of Scott’s practice and presents a complex event object for Scott to engage an audience. 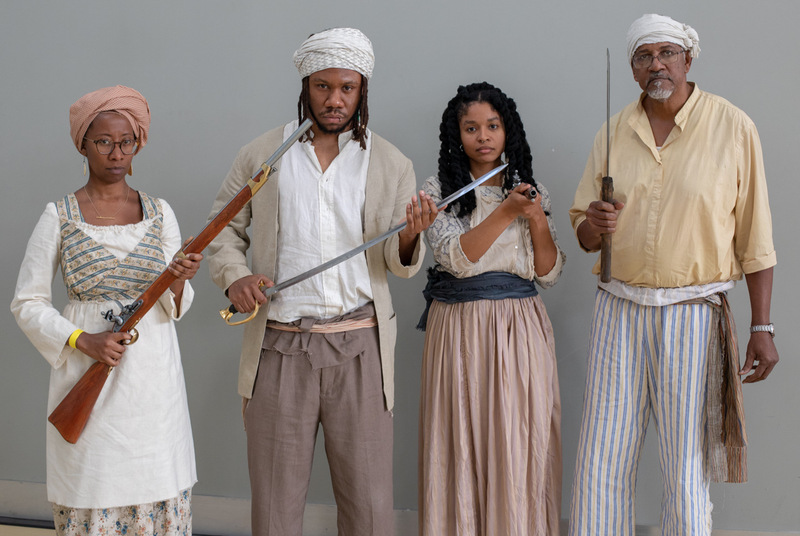 The piece aims to amass 500 reenactors to embody the role of an army of the enslaved who will march along the original route of the Slave Rebellion of 1811 through rural Louisiana towns and streets through Novemebr 9-10 of 2019. By bringing an artistic focus back to a project like “Slave Rebellion Reenactment”, there is a strong emphasis on the role of public performance. Scott predicts a dualistic reception to the work where one side engages directly with a history of radical actions towards freedom and the other views the piece as a spectacle. The image Scott is invoking through public performance presents a confronting scene in an area with a long-standing history of racial issues in the United States. It was only this November in Louisiana that a law connected to Jim Crow-era policies on having a split-jury, which has disproportionately impacted the number of African Americans to be incarcerated with life sentences, was finally removed by voters. Scott hopes that the project will shed light on how the current issues in society cannot be easily solved. However, “Slave Rebellion Reenactment” is not only a project reflecting on history, but also promotes a method of organizing people to enact drastic social change. Scott has utilized a number of strategies from the original Rebellion of 1811 as the framework for piecing together “Slave Rebellion Reenactment”. Participants in the reenactment are being gathered by word of mouth and in small group meetings, which Scott is documenting throughout the project’s process. Reflecting on the past and bringing it back to the present, I asked Scott what he thought were the most important dialogues that we can be having now. Lastly, during our discussion, I asked Scott what he thought about the shifting modes of representation and aesthetics in art and how his work with “Slave Rebellion Reenactment” fits in with artistic discourse. In a time where political and social tumult is so apparent and defined, artistic works are no longer the decorative pieces to frame social conversation. Rather art holds its own political power to generate discourse using aesthetics as the means. Lyndsey Walsh (MSc, Biological Arts) is an American artist and researcher. Her work investigates different knowledge systems and explores their accompanying ideologies and influential narratives. Walsh primarily works aritsitcally with biological materials including stem cells and cancer.